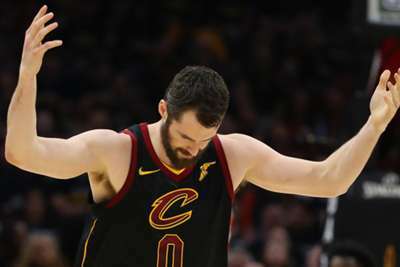 Kevin Love has undergone surgery on his injured left foot and is facing an extended absence, the Cleveland Cavaliers announced on Friday. It had been reported the Cavs were preparing for the possibility that their star forward could miss more than a month because of a toe injury, before the ailment was confirmed. Love was said to have been limping after Cleveland's loss to the high-flying Denver Nuggets. "[Love] will now undergo an extended period of treatment and rehabilitation, with the timeline for his return to basketball activity updated in approximately six weeks," a statement read. Love signed a four-year contract extension worth $120million this offseason. He was averaging 19 points and 13.5 rebounds per game before getting hurt. The 30-year-old's injury is the latest blow to a team who are 1-7 and fired coach Tyronn Lue after their losing start.